Credit: http://janebinnion.com. All rights reserved. As healthy food fuels the body, so does brain food fuel the mind. Garbage in, garbage out as they say. Quality output demands quality input. Amidst the “sky is falling” debates over how TV and the Internet are making us mindless drones, this is the real issue to keep in mind — we need to cultivate more than we consume. In Steven Covey’s bestseller The 7 Habits of Highly Effective People, he describes this as evaluating your Circle of Control vs. your Circle of Concern. The idea is that you should be seeking out relevant, useful information that you will apply to your life far more often than you let random information interrupt you. 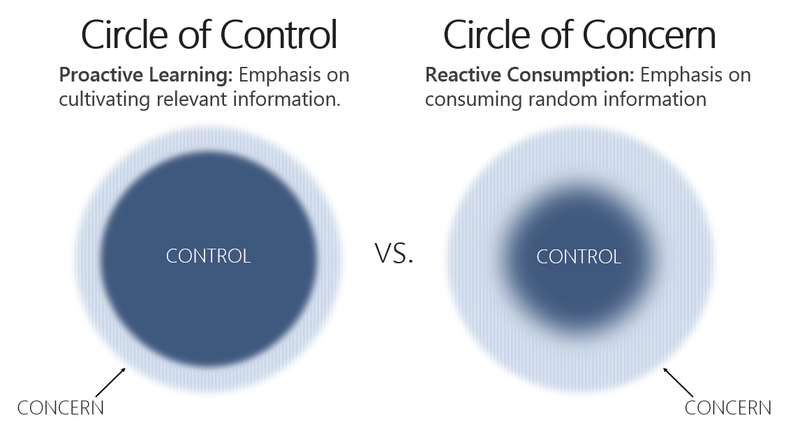 The Circle of Control is anything that relates directly to you; situations where you influence the outcome, like the skills you build, the projects you create, or the habits you engage in—basically information that improves how you spend your time. It places emphasis on your attention as a valuable, limited resource, and something you should guard as such. If you give it away freely, you may develop the “fear of missing out” that causes mindless interaction with information that isn’t relevant to you. Consider the news. While trying to stay updated on current events is a noble goal for any citizen, think about what you give the news and what it gives back — you give your attention, energy, time, and emotional reactions, all for information that you can rarely utilize. What some scandalous politician did in a country you don’t even live in may creep into your Circle of Concern, draining your focus via an issue that you cannot use later in any meaningful way. Put simply, 99 per cent of what you will see won’t matter to you. Improving job skills. The sentiment that education begins when school ends is one to not take lightly. Funny that we use terms like “investing” in reference to our time; when’s the last time you invested in developing the skills you use at work? It could become the single best investment in your portfolio. Experimenting with new interests. You can look at other people’s vacation photos on Facebook, or you could read How to Travel the World on $50 a Day and take the first step in planning that backpacking adventure you’ve put off. You can watch Shark Tank, or you could pick up a few business books. Creating more work/art. We’re all strapped for time. It’s often the case that the most productive thing you can do all day is say “No” to things that don’t matter. MIT professor Alan Lightman only checks email once every 3 months; imagine what you could create if you just said “No” to much smaller commitments. Getting intentional with your learning. The shocking truth is out: I still read the news. But I seek out my interests—I don’t just accept what’s on the front page. For instance, I always read Maria Konnikova’s fascinating coverage of the brain because it’s proven to consistently be in my wheelhouse. What matters is that I feel satisfied with where my time is being spent as a whole. That’s the most important takeaway—are you giving priority to your Circle of Control? Or is your Circle of Concern eating up too much of your attention? This is why I think that the “news is bad for you” arguments are missing some context. Health and happiness are determined by how you spend your time overall. It’s the compounding interest that produces the biggest results, not individual swings. Not watching the news but spending the resulting free time poorly is like not eating red meat, bragging about it, and then chowing down on 3 square cupcakes a day. How you spend your time is how you spend your life, so we should all try to invest wisely. This article was first published on Sparring Mind.